Every year I try to find a book that focuses on the meaning of Christmas, and this year I hit the jackpot. I read Christmas Jars by Jason Wright yesterday. It is a quick read, but it packs a punch. The whole concept of the book appeals to me - a pay it forward gift for those in need. The ending was a bit contrived (the author worked too hard to tie up some loose ends), but it didn't diminish the impact the story had on me. I recommend this book to anyone who has lost faith in the spirit of Christmas or in mankind or just wants a booster shot of goodwill. You should be able to read it in an afternoon, but the message will stay with you indefinitely. Something about being in the city amid the pre-holiday bustle motivated me to drag my Christmas tree out of the garage. Yep, it is no longer the Lonesome Pine. The tree used to stand proudly in the front room so it could be seen from the street; however, I placed it in the room closest to the garage so I would not have to handle it more than necessary. Actually, I spend more time in this room anyway so I will be able to enjoy it more. I love to sit in the darkened room with only the tree lights lit. It is very calming to look at the tree and remember past holidays and traditions. A lot of my other holiday house decorations have come out of hibernation, too. I have slowly emptied the storage tubs and placed the cheery displays around the house. I am thankful for the burst of energy that allowed me to bring these old friends back into my home. They will remain on display until the middle of January when they will be returned to storage. Hopefully in the years to come, my Christmas tree will be lonesome no more. Old World maps have much in common with today's Map Quest and GPS mapping. If a development is new, these modern devices do not have a clue of the location of the address, so the warning, "Beyond this point, there be demons" is so very true. My niece moved into a new home in a new development and the postal service did not know where the street was located. They refused to delivery to the neighborhood because the road/street was not on their maps. I am driving to her home tomorrow and even though I have been there several times, I have never actually driven there. I tried to get driving directions only to find that her address/street is not in the system. Once I am in the area, I am confident that I can find her home, so I toyed with Map Quest for a bit and now I have a general idea where I am going. If I see mermaids or dragons, I am going to lock the doors and hit the accelerator! Even though they are compressed in three Space Bags, the wool sweaters that I purchased at several thrift shops in Denver are taunting me. Why on earth did I buy 47 sweaters? Yes, that is right 47 wool sweaters! Very few of them are even in my size, but I didn't purchase the sweaters to wear. Who in their right mind buys 47 sweaters? I don't claim to even be in my right mind, but I purchased them because I love to knit and do a lot of charity knitting. So many of the charities require natural fibers, and I definitely cannot afford to buy the wool that I need for these projects. So, I purchase 100% wool or wool-blend sweaters and ravel them for the wool. It is a messy and time-consuming process, but well worth it in the end. 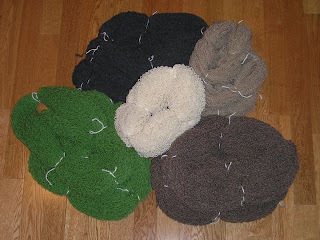 An average sweater will yield a minimum of four skeins of wool yarn. Anyone who has priced wool knows that each skein is at least $10 and sometimes even $20 or more. Thus, I can justify spending an average of $3 a sweater to obtain, at the very least, $40 worth of yarn. Before this last shopping spree, I had dismantled, washed, and skeined the wool from ten sweaters. I have already knit the wool from two of them. Once I process the sweaters that are compressed in the Space Bags, I should have a yarn stash worth $1,880 for an investment of $140. I wish that my CD's earned as much! The yarn is wound into skeins after the sweater is ravelled. 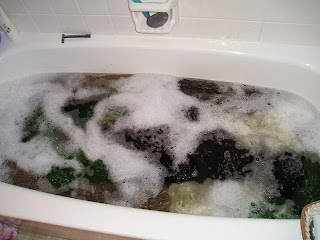 The yarn skeins are placed in a sudsy hot water bath. 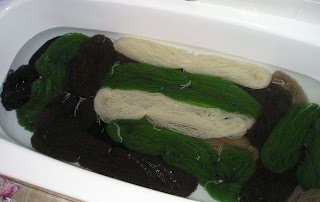 They are allowed to soak for two hours so the fibers can relax and return to a natural state. Gently squeeze the skeins and place in a hot water rinse for another hour. Then gently squeeze the yarn to remove excess water. Drape the skeins on hangers and allow to drip dry. I place a rolled towel in the bottom loop of the skein to absorb moisture which allow faster drying. Make sure yarn is completely dry before storing or using. I have since learned to gently squeeze out the excess water and then put the hanks in the washer and spin out the rest of the water. Spin only do not agitate and then hang to dry. This is a time-consuming process, but satisfying. Recycling is worthwhile in more ways than saving money. I wish more people would take the initiative. No matter if it is my own thought/opinion or someone else's, it is ALL hot air. I've rolled my eyes (literally or figuratively) at someone's tirade in the past, and no doubt others have done the same at mine. Be prepared to roll your eyes at some of the things that I write. It will not bother me in the least: it's all hot air.